With the introduction of the Life orientation subject at school, there is a need not only to provide students with certificates but also essential skills they can carry with them for the rest of their lives. 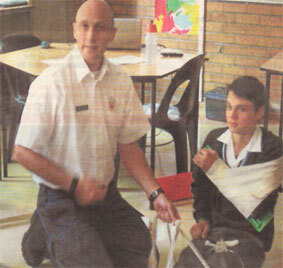 At First on Scene we have recognized that First Aid training provides both of these requirements and provides the school with qualified First Aiders for sports events, social events and mass casualty incidents. All the schools we are currently training at send around 50-80 students per course. The best way, we find, to approach this is to split the students up into groups of 10. We then bring in a number of instructors who will each teach part of the course. Students will then move from one instructor to another for 2 hour blocks of training. This way each block is a new experience for the student and holds their attention for the full duration of the course. We can train smaller groups as well and would tailor the number of instructors to suit the number of students.